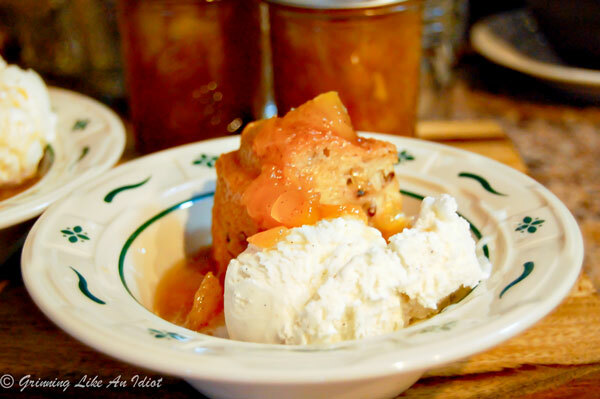 Peaches are abundant this time of year and if you are looking for a recipe that will delight the sweet tooth with sophisticated twist, you must try one of our family favorites that I originally posted in 2012, Peach Wine Sauce! Recently I was introduced to 14 Hands Wine and it has become one of my favorites. 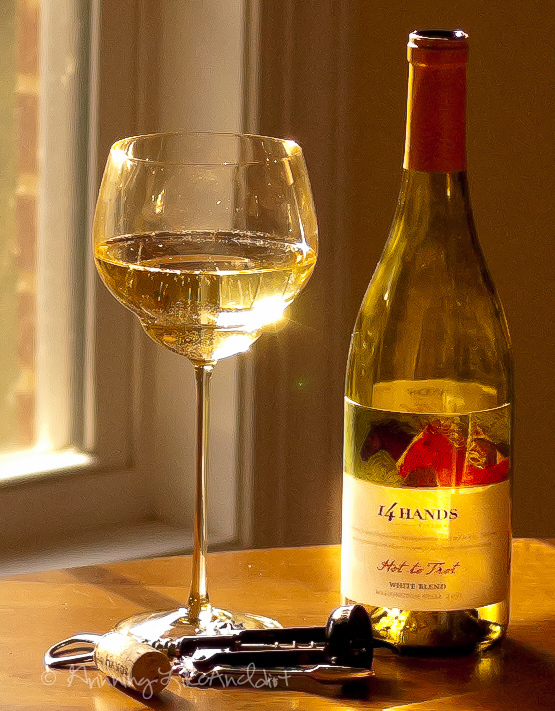 The 14 Hands Hot to Trot White Blend's flavor is crisp, light and leaves a fruity taste, but not too sweet that you won't want another glass. While relaxing on our back porch, the next sip of the 14 Hands White Blend took me back to the summer of 1999 in Prague. As part of my MBA program, I was studying abroad in a little town outside of Prague. In this little town, the only place that we knew what we were ordering was a pizza place. After about a week of pizza, we finally ventured to another restaurant where we simply pointed at something on the menu and hoped for the best. It was fantastic! Grilled chicken with a peach sauce...I haven't had its likeness in the US and the memory has stayed with me all these years. So when I put together this recipe, I had that wonderful dish in mind. As it turned out, the Wine Peach Sauce also stole the show on top of other foods, like ice-cream! (I took this picture in the evening with the light coming through the window). 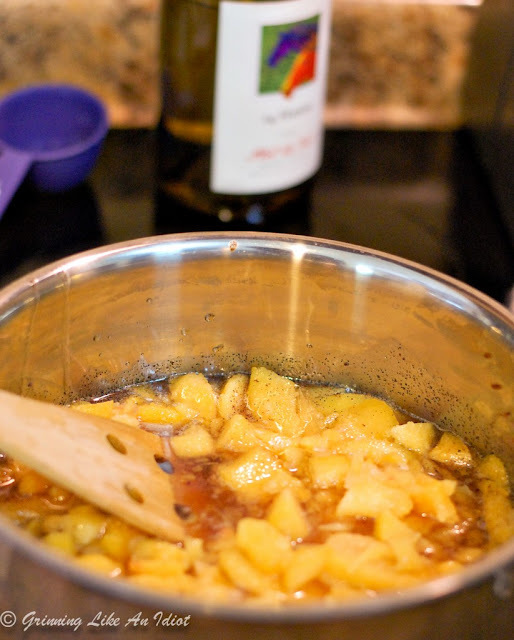 The recipe uses 14 Hands Hot to Trot White Blend, a vanilla bean, peaches, sugar, cinnamon, nutmeg and a pinch of salt. 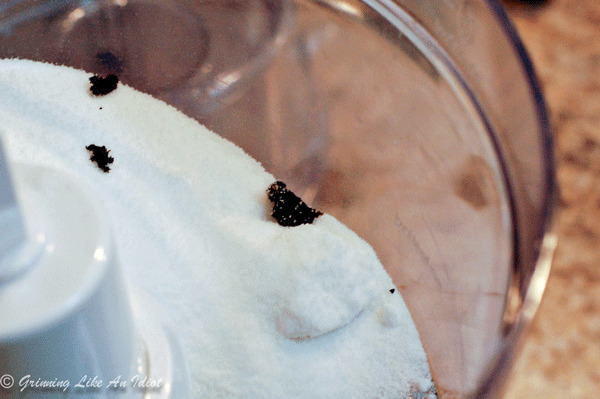 First make the vanilla bean sugar: scrape the contents of one vanilla bean into 1 2/3 cups of sugar and process in a food processor. Combine the vanilla bean sugar with 1 1/2 cup of 14 Hands White Blend, 1 tsp ground cinnamon, 1/4 tsp ground nutmeg, pinch of salt. Stir constantly on Medium to High setting until the sugar dissolves and it comes to a rolling boil. Once it comes to a rolling boil, add in the coarsely chopped and skinned peaches (FYI - it's easier to use frozen peaches and thaw). Bring it back to a rolling boil and cook until the liquid is more of a syrup. This little bit filled 5 pints; 3 pints were eaten right away and I put two back (one for a friend and one for when I really really want a decadent treat). We tried it on Grilled Chicken, which was awesome and we tried it on Vanilla Ice cream with Butter-cream Pecan Cake on the side. It was fantastic on all 3! I just had a thought, this MUST go on pancakes! For instructions on how to can (or put up), check out a previous post: Strawberry Jam, once you try canning, you'll continue to use it. Cut the vanilla bean length wise and scrape out the contents with the back of a knife. Combine the 1 2/3 cup of sugar and vanilla bean in a food processor. Combine the vanilla bean sugar with cinnamon, nutmeg, wine and a pinch of salt. Cook over medium-high heat, stirring constantly until a rolling boil. Add peaches. Stirring constantly, bring back to a rolling boil until the liquid becomes thick (about 8 minutes). Pour hot mixture into hot jars, filling to 1/4 inch from top. Wipe jar rims. Cover at once with metal lids, and screw on bands. Process in boiling-water bath 10 minutes.